Would you like to enjoy a wonderful 30-minute facial from a skincare expert, using top-quality and all-natural products from some of our favourite brands –all for just €10? That’s exactly what you can have at Evolv during our Spring Into Health Week 2017, which runs from Monday February 27 to Saturday March 4. A Dr Haushcka facial with our own specialist Josephine Byrne, available on Monday Feb. 27, Wednesday March 1, and Saturday March 4. A Dead Sea Magik facial, also with Josephine Byrne, available on Tuesday Feb. 28. A Seavite facial, with Dawn from Seavite, available on Thursday March 2. A Holos facial, with local woman Niamh Hogan (developer and producer of Holos products), available on Friday March 3. There are just a limited number of appointments available each day, so be sure to book early to make sure you can enjoy this wonderful offer. Just call us at (053) 923 6009. Dr Hauschka is one of the world’s leading producers of natural and organic skin care products. We stock a large range of Dr Hauschka products all year round, and you can use your facial appointment to learn more about them and which ones will best suit you and your complexion. Dead Sea Magik products are all based on salts and other minerals from the Dead Sea, and will leave your skin feeling wonderful and rejuvenated. 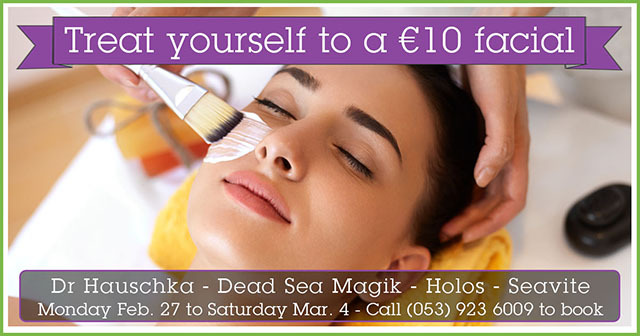 If you haven’t already tried Dead Sea Magik, then our €10 offer is a great way to find out more! Seavite is a range of seaweed products and organic and natural beauty products produced right here in Ireland, that infuse your skin with essential nutrients for youthful suppleness. Dawn from Seavite will be able to tell you more about them and their qualities during your appointment. Holos plant-based aromatherapy skincare products were developed and are produced right here in Enniscorthy by local woman Niamh Hogan, who we are big supporters of. Holos Skincare is also supported by Eleanor McEvoy of RTE’s ‘Dragon’s Den’, who made a €50,000 offer when Niamh appeared on the programme during 2016. Remember that appointments to enjoy facials with all these wonderful products are limited. Call us at (053) 923 6009 soon to book yours, to avoid disappointment.